Wool Paintings by Oksana Ball > Blog > What benefits can we get working with wool? What benefits can we get working with wool? Have you ever thought of why someone would choose one type of handiwork over another? I think the reason is part of our individual make-up and that each of us is looking for something to complete us, spiritually as well as physically. I won’t delve into the scientific jargon for the reasoning behind this, but will try to offer a simple explanation. After a hard day of labor at the workplace, every craftsperson knows why they run to their crafting hobby: the idea of rubbing their hands together in delight and exclaiming, “I made this, my own beautiful creation!” They want to enter a different world and calm their inner self. The crafting process relieves everyday stresses; but exactly how does it function? The brain is very complex and many scientists attempt to understand how it works. But even without a scientific degree, we realize that we get tired of keeping a thousand items active in our mind: home cleanliness, correct parenting, transporting kids to and from events, eating healthy food, exercising, shopping, paying bills, etc. We want to stop and exhale for a while. Hobbies are like a relaxing yoga session for the brain; they transport us into a kind of meditation. While in this condition, the brain disconnects from daily bustle and routine. We let our consciousness turn off from the endless race of processing external factors and turn our attention within ourselves. The subjects and even the colors we choose for our creative works are not accidental. Through the use of color comes a restoration of our mind on a subtle level, on the level of the psyche. We replenish what we need the most. One manner of renewal, as you’ve probably already guessed, is art-therapy. With wool, it is a simple pleasure. If you use paints in your artwork, you will use very small amounts of the substance. But when you work with wool, you can take a large handful of red, combed ribbon wool and completely bury yourself in it. In other words, the color itself becomes the material. You can touch it, pet it, and burrow in it to receive more pleasure and satisfaction – it is tangible. Another advantage of using wool is the incredible tactile sensation you feel when handling the fibers. In ancient times, the cat was recommended as a medicinal animal. When you were tired – you would just pet the cat and talk to her, then you would sense that life was getting better. Of course, petting a living animal can’t fully compare with touching wool; although it is a natural material, it is not really alive. But with one touch of sheep’s wool, you remember all the fluffiest kittens and lambs you’ve ever touched. This memory is invoked from the softness, tenderness, and warmth the wool gives to us. As an exact opposite, imagine that you are working with something stiff, prickly, and cold. What feelings will you have? Certainly not calm, peace or tranquility. Rather, more concentration is required to become relaxed when working with those materials. Thus, it turns out that any contact with wool, as part of our craftwork, affects us immediately on three main fronts, and we: a) rest our eyes, absorbing and recharging with the energy of pure colors; b) calm our brains and senses, switching from routine to a world of beauty; and, c) literally treat our irritability and bad temper through tactile contact with the wool strands. I love crafting images in wool and sharing my knowledge with others. 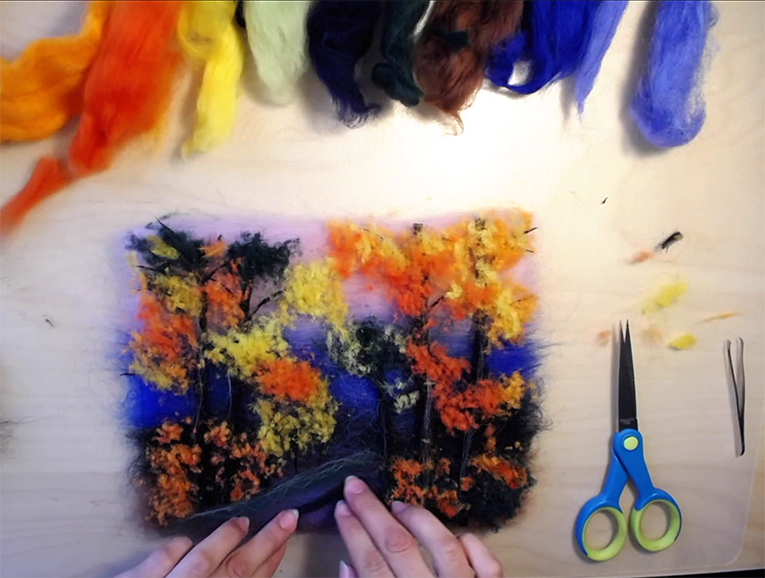 I teach three types of wool painting classes: group, individual and online. I have also published several tutorial books on how you can create some of my works of art. So, if you would like to try to fashion something beautiful, I will be waiting for you in my workshop.